The following maps and graphics offer some insights into where these jobs are located and how much workers are paid in those parts of the country. Map: The biggest meat processing facilities. To view the interactive map and to learn about the processing facilities, view the original article. While big cities employ a large number of slaughterhouse workers, those jobs make up a relatively small share of the total employment opportunities. 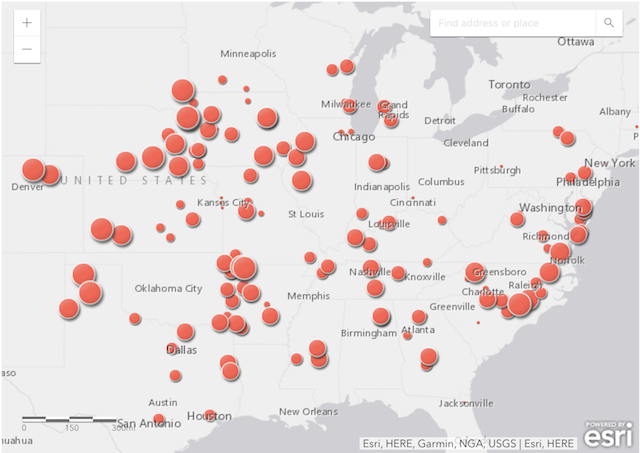 The parts of the U.S. that employ the most slaughterhouse workers include many major metro areas. But these jobs make up a relatively small portion of the total jobs available in big cities like Chicago and LA. In many of the locations where meat cutter, butcher, slaughterer, trimmer and packer jobs are most plentiful, the mean hourly wage trends at or below $15.00. That means where slaughterhouses provide a large portion of the available jobs, the pay is below the median hourly wage nationwide ($17.09). Southeast coastal North Carolina nonmetropolitan area is a good example. The top five occupations are food preparation (including servers and fast food), cashiers, retail sales, nursing assistants and slaughterers and meat packers. When the other two BLS classifications for slaughterhouse workers are included, processing jobs in Southeast North Carolina are second only to fast food and waiting tables. Slaughterhouse work is one of the top employment sources in Southeast North Carolina - far higher than in other parts of the country (location quotient), and slightly better paying. Wages for meat processors are stronger in some parts of America. Areas where the mean hourly wage is more than $20 per hour are mostly in New England or the west coast, with the exception of a couple locations in Wisconsin North Dakota. None of the areas paying that wage employ more than 250 people. In areas where meat processing makes up a larger portion of total employment, mean hourly wage does improve, but is still well below the national average of $24.34. Christopher Walljasper is an investigative reporter and audio producer in Chicago and across the Midwest. He has covered a variety of issues, including rural America, business, technology, real estate and national security. The wage rate just might explain why a comparable house is much cheaper in Kansas than San Francisco or why non union members take home more money than union members because they don't pay union dues and work in more efficient environments.